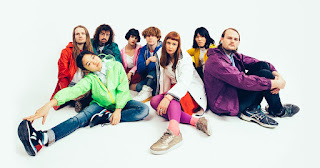 A free gig courtesy of Spotify saw me spending the evening see Superorganism, current media darlings of the music press. I've been listening to their stuff for a little while and I guess that's why I was chosen to go along. It was well organised; in addition to the free entry we got free drinks and a free cloakroom. The crowd were a bit odd not wanting to get too close to the front of the room; I spent most of the set on my own holding the rail. The band are really good live, and have Go-Team, Polyphonic spree vibe to them. The little Japanese/American front person is very comfortable with a mic, and interacting with the crowd. The songs are catchy and getting lots of radio airplay. I'm also going to be seeing them again later in the year at a festival, where I think they'll win over the crowd.